Just as you wouldn’t want to hear the sounds of screeching metal or laboring motors before you got on a park ride at Six Flags, you definitely don’t want to hear such sounds before you drive under your garage door. If your garage door is making noisy protests each time it opens or closes, this could indicate a serious and potentially dangerous problem. Fortunately, with garage door service Santa Clarita CA from Carroll Garage Doors, you can discover and correct the problem right away. 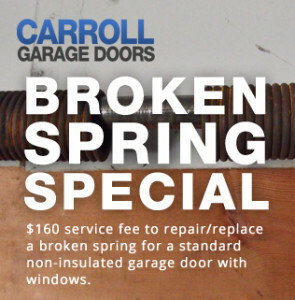 Because of our strong commitment to safety, Carroll Garage Doors is an excellent choice for garage door spring repair Santa Clarita CA. Our fully trained technicians have the special tools and expertise required to remove broken springs safely, without risk of injuring themselves, damaging your property, or exposing you to liability issues. If your garage door springs need replacing, don’t risk your safety trying to handle the job yourself! Instead, call in the pros. We’ll get the old spring removed safely and the new spring or springs installed correctly.